Once again, we get visual proof that it pays to check out Nature's outstanding engineering tricks in order to work up interesting machines that behave in innovative ways—for machines, that is. How so? "The flic-flac spider can walk like other spiders. It can also propel itself into the air, however, with a combined sequence of somersaulting and rolling on the ground." The walking and tumbling robot has its origins in the work of Professor Ingo Rechenberg, a bionics professor at the TU Berlin. He spotted the spider in the Erg Chebbi desert on the edge of the Sahara in 2008. In 2014, ScienceDaily reported that "Prof. Dr. Rechenberg was so inspired by the flic-flac spider's ingenious mode of locomotion that he developed a 25cm long model of a spider robot." Now, "Since its discovery, Professor Rechenberg has been working on transferring its movement patterns to the technical field," Festo has said. "The studies into the spider's behaviour led to the design of various robots that can propel themselves on difficult terrain." Nature's walk and roll spider is an example of what Scientific American has called "One of the strangest defense mechanisms ever observed in nature, flic-flacking, as it's known in the scientific literature." According to Bec Crew writing in Scientific American, the move is "essentially cartwheeling to avoid danger." It's been seen in a handful of animals around the world, said Crew. As for the Namib spider, Crew said "It lives in constant fear of the parasitic Pompilid wasp—a particularly nasty predator that goes to great lengths to snare its prey." 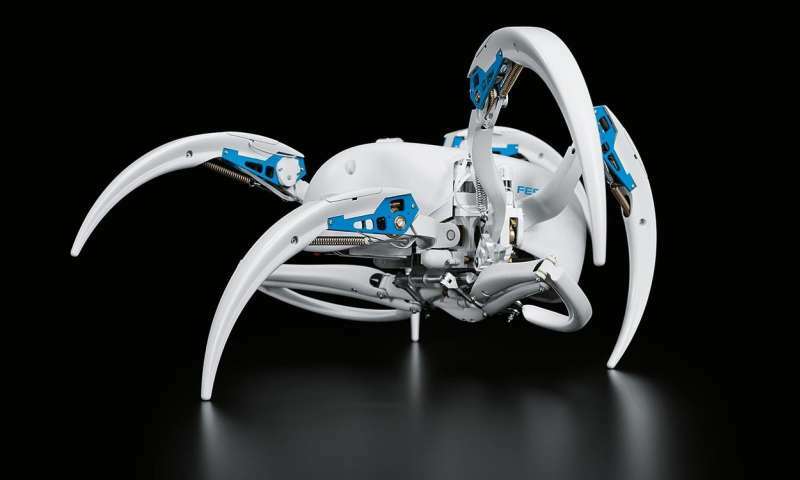 Together with the professor, the Festo bionics team explored the spider's movement patterns. How does it walk? 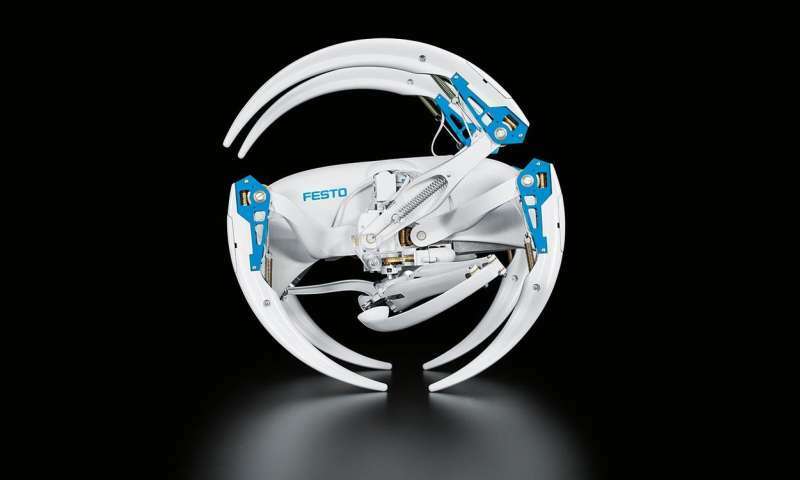 The Festo brochure said it uses 6 of its 8 legs to walk. The other two are push-off legs and are folded up. "For every step, three legs remain on the ground, whilst the other three are lifted, moved forward and then put back down on the ground. With the same sequence, the BionicWheelBot then moves the other three legs forward that were just on the ground." Festo said 15 motors fit in the knee joints and body. Festo also noted 14 automatic-locking worm gear units. They ensure the spider "only has to use energy when moving its legs—not, however, to keep its body upright when standing still." The spider-like walk-and-roll robot is all set for the Hannover Messe 2018 industrial technology fair from April 23 to 27. Hannover Messe is billed as the world's leading trade show for industrial technology. Spiders? I think rather star wars no?